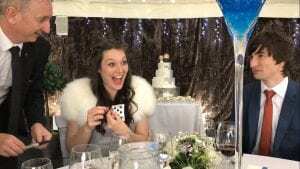 Birmingham Wedding Magician at Hogarths. The wedding of Steph and Adam was a lovely Bank Holiday Wedding. 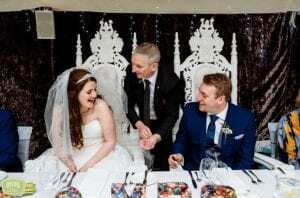 They had booked after meeting me at the Wedding fair there last year.Firstly it was mix and mingle for the guests outside. 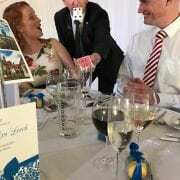 Then it was sone table magic at the wedding breakfast. 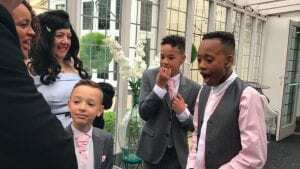 The guests were a great laugh and the photos below show them having some great reactions. 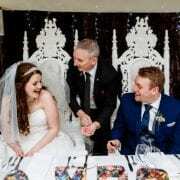 Worcestershire Wedding Magician Owen Strickland- was today booked at The Fold In Bransford Worcester. I was performing for the guests of Kate and Matt. 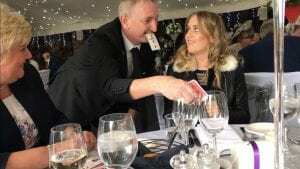 Firstly I performed mix and mingle magic as guests arrived. 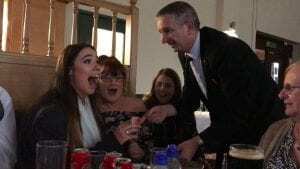 Then it was table magic during the Afternoon Tea. An early shower soon passed, leaving a lovely sunny day for the festivities .The below photos were taken outside, where I performed my signature Bride and Groom Tricks. The Fold is a venue I hadn’t perviously been to, but a lovely venue. Perfect for a smaller wedding its just a few miles outside Worcester. I will look forward to returning! Im delighted to announce that Walsall Magician Owen Strickland has won the Best Entertainer in The UK Best Of Awards. 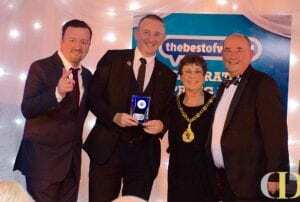 At a lovely ceremony in Walsall I collected my trophy from The Mayor of Walsall and “David Brent” who is in fact the fabulously funny Tim Oliver.The ceremony celebrated the Best Businesses of Walsall, many of whom also won the National Award. 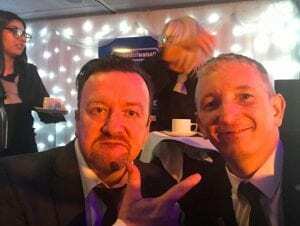 Tim Oliver stole the show with his amazing David Brent impression. He is so close to the real one, its uncanny. I was in stitches all night and was lucky enough to sit next to him throughout the meal. Since joining The Best of I have received over 200 5 star reviews from happy Clients. The Majority of these are Brides and Grooms whose Wedding I have been privileged to perform at. 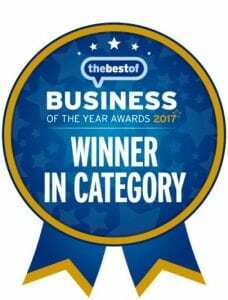 This Award comes relatively quickly after The 2017 Wedding Industry Awards Best Wedding Entertainer Midlands Region. These two awards have been such a massive honour for me to win. I am so grateful to all those that have voted in both. 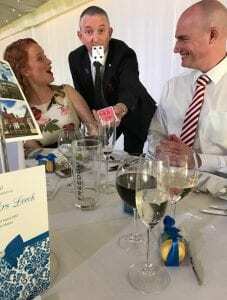 Walsall Wedding Magician Owen Strickland performed at Gunners Club 2 in Walsall. Its nice to have a 10 minute drive home after a wedding!! 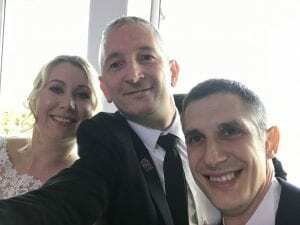 Congratulations to Dave and Lisa whose wedding it was. 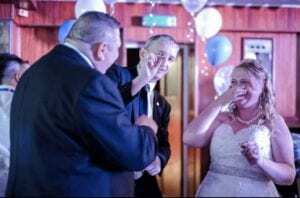 Staffordshire Wedding Magician Owen Strickland at Crows Nest Barton Marina. 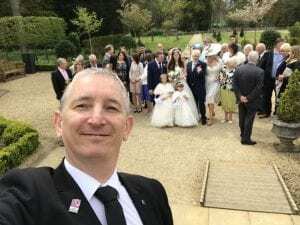 On a glorious sunny day and perfect weather, todays Wedding was that of Richard and Jasmine. 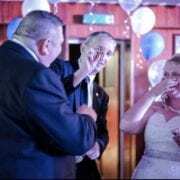 I was booked as a surprise for the groom by Mum Helen after meeting them at an Open Evening last year. Crows Nest is a lovely venue that is raised above the Marina at Barton. It has a lovely balcony overlooking the Marina, so on a glorious sunny day like today it showed it all in its glory. 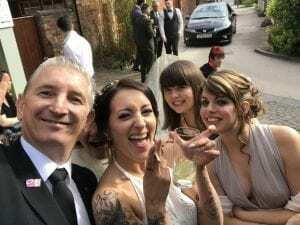 Today Warwickshire Wedding Magician Owen Strickland was at Moxhull Hall for the wedding of Emma and Andrew. 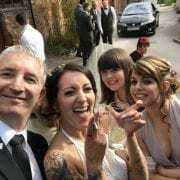 It was my first Wedding back at Moxhull for a while. 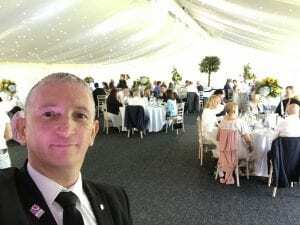 I was booked for the post ceremony drinks reception, but just had time to pop into the Marquee. 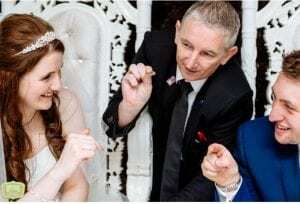 Here I performed my speciality tricks for the Bride and Groom . There is a still from it below showing Emma’s reaction.